We’d love your help. 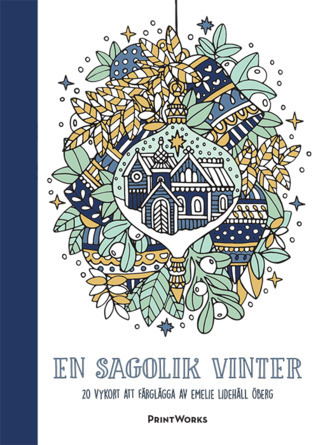 Let us know what’s wrong with this preview of En Sagolik Vinter by Emelie Lidehäll Öberg. This book contains 20 postcards filled with imaginative fairytale landscapes in a winter wonderland. Color and send to a friend, or hang on a wall! To ask other readers questions about En Sagolik Vinter, please sign up. This postcard book holds 20 images and like all Pagina postcard books, they’re not exactly the standard poscard size so keep that in mind if you want to send them, I’ve had problems finding envelopes. But for coloring, they’re a great size, nice short projects. The cardstock is fantastic, it will take a lot of beating and water. I did my example with pencils though but Inktense and such would be awesome on it as well. The images are all in Emelie’s distinct style, depicting wintery fairytale-y scenes, everything from Christmas decorations to girls. I love her unique imagery, you can’t mistake her work for anyone elses. The biggest thing I like about these wintery books lately is… that I hate winter. I seriously do. I live in a cold dark country where most of the year it’s either winter or getting there. It’s like freaking Game of Thrones here, our national emblem should hold “Winter is coming”. I’m amazed I don’t have the undead in my backyard. So anyway I have a sort of a hate-hate relationship with the winter and I do appreciate things that remind me that it can be pretty and nice and Christmasy. So this book really does it for me, I am happy it came into my life.